are offered for rental, taxi and delivery services wherein the ownership continues to be with eBikeGo. A franchise owner can offer all three services and gets 90 per cent of the revenue, mentions eBikeGo. The company presently uses Okinawa Ridge plus electric scooters to operate in the country's capital. However, it plans to use electric scooters that will be manufactured by Garvit eBike. 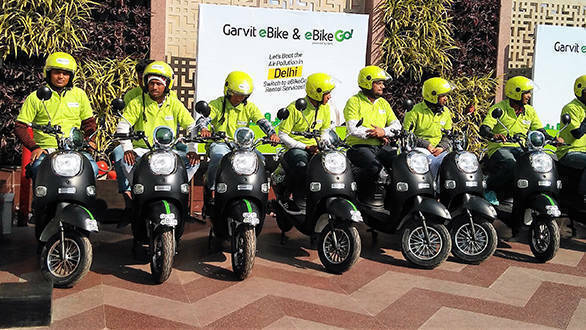 "We are extremely proud to launch Garvit eBikes in Delhi. Our aim is to expand our operations pan India which makes India to adopt an eco-friendly means of transportation and also makes travel cheaper and efficient for the fast-paced lives of modern Indians. Garvit eBike uses lithium ion (Lion) batteries which is completely biodegradable and helps in decreasing the accumulation of hazardous electronic waste. By introducing these scooters, our primary motive is to reduce pollution by atleast two per cent this year which is emitted by petrol two wheeler. Garvit eBikes will be the most cost-effective means of transport in the city in the coming days. The cost of running is as minimal as 20 paisa/km for an average speed of 80kmph and thus eBikeGo will be offering rentals starting with a minimum amount of Rs.20 for 30 minutes." eBikeGo states, compared to other players in the conventional two-wheeler rental space, majority of the money is spent on petrol in addition to its daily rental. However, in case of the electric two-wheelers, the user has to pay only the rental amount of Rs 200 per day and get a fully charged scooter. With these services, eBikeGo is targeting travellers, students, working executives and also delivery chains. The company will charge a daily rent of Rs. 200 whereas the monthly rent will be different. eBikeGo plans to position a minimum of 30,000 electric bikes in each metro city in India in the coming months. Anywhere. A customer can either book an eBike by using their mobile application or by contacting the customer care number at 7300073730.